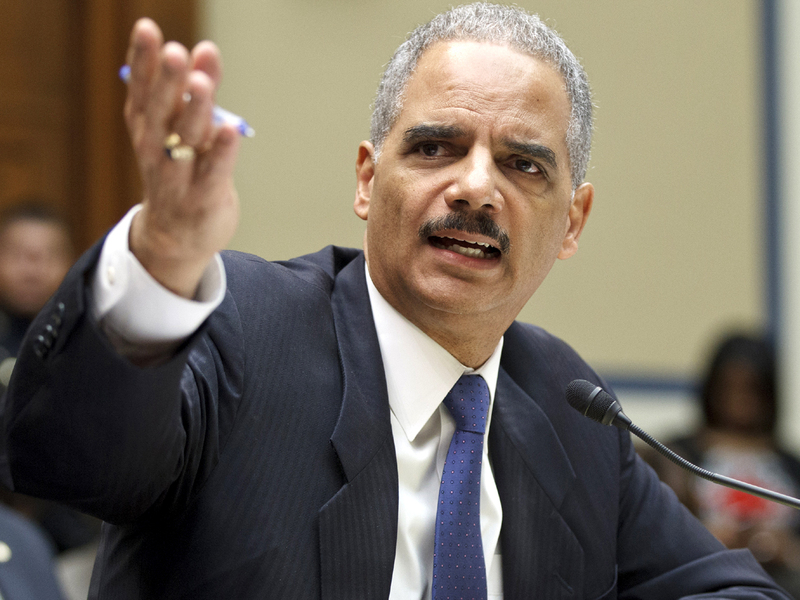 Holder: Fast and Furious "has become political"
WASHINGTON - Attorney General Eric Holder squared off Thursday with Republicans on a House committee who are demanding that the Justice Department turn over documents about its handling of congressional inquiries into a flawed gun-smuggling investigation known as Operation Fast and Furious. At the start of a hearing, chairman Darrell Issa, R-Calif., said the House Oversight and Government Reform Committee will do what is necessary to force the Justice Department to produce the information. The attorney general said he will consider Issa's demand. But he said, with one exception, the department was inclined to follow longstanding tradition of withholding internal documents about congressional inquiries in order to preserve the ability to get candid advice from top officials. "I think you're hiding behind something here," Rep. Dan Burton, R-Ind., told Holder. "You ought to give us the documents. ... It appears we're being stonewalled." Burton, a former chairman of the committee, said he would urge Issa to seek a contempt of Congress citation if the Justice Department does not produce the congressionally subpoenaed documents. Issa has already threatened to seek a contempt ruling against Holder for failing to turn over the documents. The lawmaker alleges the Justice Department is engaging in a cover-up. "This has become political, that's fine," Holder said later at the hearing, but there is no attempt "at a cover-up." The Justice Department, Holder insisted, "will continue to share huge amounts of information." Before the hearing started, Issa introduced Holder to federal agent John Dodson, one of the whistleblowers in the Bureau of Alcohol, Tobacco, Firearms and Explosives who first told Congress a year ago about the use of a tactic known as gun-walking in the Phoenix-based Fast and Furious investigation. The tactic involves allowing suspected "straw buyers" of weapons to walk away from gun stores with their illicit purchases, rather than arresting them there. Instead, agents tried to track the low-level buyers and the guns to smuggling ringleaders and financiers, including Mexican drug gang leaders, who have long eluded prosecution for their role in the flow of guns into Mexico. ATF's Phoenix division has tried this tactic, with minor variations, in at least four investigations beginning in 2006 during the George W. Bush administration. It began three such probes under Mr. Bush before launching Fast and Furious under President Obama. All of the probes encountered problems. In Fast and Furious, agents lost track of nearly 1,400 of the more than 2,000 guns purchased by suspected straw buyers. Some 700 guns connected to suspects in the operation have been recovered in Mexico and the U.S., some at crime scenes, including the one near Nogales, Ariz., where border agent Brian Terry was murdered in December 2010. A month after Terry's death, Congress began hearing of problems with the probe. Under pressure from lawmakers, Holder has shaken up the leadership of ATF, and the Justice Department's inspector general is conducting an internal investigation of the operation. After multiple congressional hearings, including six appearances by Holder, Republicans were still voicing outrage Thursday. Guns that walked in Fast and Furious are going to show up in Arizona "from here to whenever," said Rep. Paul Gosar, R-Ariz. "We should be sharing information." On Wednesday, Deputy Attorney General James Cole said the department will provide documents created after Feb. 4, 2011, the day the department gave incorrect information to Congress about Fast and Furious. Cole said the department had made an exception to longstanding policy in order to provide material on how the erroneous Feb. 4 letter was created, but he said other documents about the congressional inquiries on Fast and Furious would not be turned over. Holder said Thursday that prior administrations have recognized that robust internal communications would be chilled if internal communications about congressional requests were disclosed to Congress. In the Feb. 4 letter to Congress, the department said federal agents made every effort to intercept illegally purchased weapons. But in reality, agents in Fast and Furious employed the risky gun-walking strategy of trying to track the weapons after purchase by small-time, illicit buyers in order to make cases against ringleaders. Allowing guns to "walk"  "whether in this administration or in the prior one  is wholly unacceptable," Holder said. He said the tactic appears to have been a misguided effort to stem the alarming number of illegal firearms trafficked each year from the United States to Mexico. A Republican staff memo created for the hearing questioned why federal agents allowed the probe to go on for over a year. Intercepts from a Drug Enforcement Administration wiretap on one of the suspects provided probable cause for federal agents to make arrests, or at the very least supplied the basis to seize the weapons, the Republican staff memo said. The memo said the Bureau of Alcohol, Tobacco, Firearms and Explosives did not act on this information. Agents could have arrested one of the suspects in December 2009 and used his arrest to work their way up the ladder to the two cartel associates, the staff memo said. "Instead, ATF wanted to get its own federal wiretaps and create its own big case," said the GOP memo. "This decision ensured that Fast and Furious lasted nearly a year longer, with 1,500 more guns being purchased  including the guns bought by another of the suspects in January 2010" found at the Terry murder scene. Democrats on the committee have pointed out that agents in the case testified that stronger U.S. laws are needed against straw buyers, because cases get thrown out of court, or prison sentences are too short, to persuade the low-level buyers to turn on their bosses.